Kalaluka on the set of Smooth Talk in 2014. 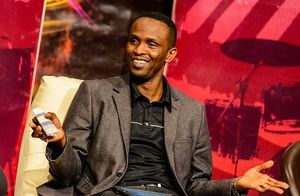 Innocent Kalaluka, popularly known as Smooth IK, is a Zambian journalist, radio and TV presenter, and creator of ZNBC's Smooth Talk and Born & Bred shows. Kalaluka was born in Senanga, Western Province to Likando Kalaluka, a prominent politician and Senanga Member of Parliament in the UNIP government of Kenneth Kaunda. He went to Lusaka Boys and Woodlands A Primary School for his primary education and then later went to Mulambwa School then St Johns for his secondary level. While in ninth grade he was selected to play in the school football team, which would make him the youngest and smallest on the pitch. However, because he would not match to the size of other senior players, he turned down the offer claiming that he had an injury. This however did not stop the school from noticing his talent and he was later made the school football team captain from tenth through to twelfth grade. He was also captain of Medical Stars, a Mongu based football club, which at this time played against ZESCO United F.C. In 2015, Kalaluka graduated from LIUTEBM University with a Masters Degree in Media. After completing secondary school, Kalaluka worked for the Barn Motel as a receptionist and months later he went to Zambia Institute of Marketing to study marketing. He then joined the Zambia National Broadcasting Corporation (ZNBC) and worked in the marketing department on attachment in 1998. Alongside marketing, he also did short story-reading and actual deejaying on ZNBC Radio 4. In 2000 he lived in South Africa and returned in to Zambia in 2001 and rejoined ZNBC as a radio presenter. At this time, ZNBC was looking for local TV production and Kalaluka took advantage and presented his proposal for a TV talk show — an idea he kept for a long time. Because he was not a TV personality, ZNBC auditioned him and asked him to set the stage and demonstrate how the show would run. He organized the audience and featured guests to be interviewed, who included JK, Kalumba Chikonde (K-Smash) and former Mr Zambia, Lloyd Kyusa. The presentation was successful and this led to the birth of Smooth Talk in 2001. In 2007 he started Born & Bred, a TV show aimed at promoting local music video production. The show subsequently necessitated the introduction of the annual Born & Bred Awards to award the deserving music videos in various categories. The first awards were presented in the studio at ZNBC. The turnout was unexpectedly overwhelming and most attendees were not able to get into the studio as it was filled to capacity. Kalaluka presents a weekly sports show on ZNBC TV called Take It To The Max. He is also a football analyst and commentator for ZNBC and Super-Sport and has given commentary on both local and international matches. Towards the end of 2011, Kalaluka made a donation of Christmas gifts to children with cancer at the University Teaching Hospital (UTH). Accompanying him was a group of Zambian celebrities who were able to talk to and inspire the children in many ways. Kalaluka has been an active supporter of other initiatives that are aimed at supporting children and improving their welfare. He has occasionally visited schools in Lusaka to give motivational talks to students and sensitize them on issues of HIV/AIDS. Innocent Kalaluka is married. His brother Likando Kalaluka SC is the Attorney General of Zambia. This page was last edited on 14 September 2016, at 16:20.